The NGO Forum met on Thursday at WDM’s offices in London. The session focused on learning from each other about supporting local group networks. The topic was obviously a hot one as about a dozen new organisations responded to the publicity and joined the session. Many of them are at the early stages of founding networks, or wanting to grow existing small networks. I was there, co-facilitating the session with Katharine from WDM. After introductions and a bit of a warm up, we heard presentations on models of local organising from staff and volunteers involved in the networks of Greenpeace, Friends of the Earth and Climate Camp. 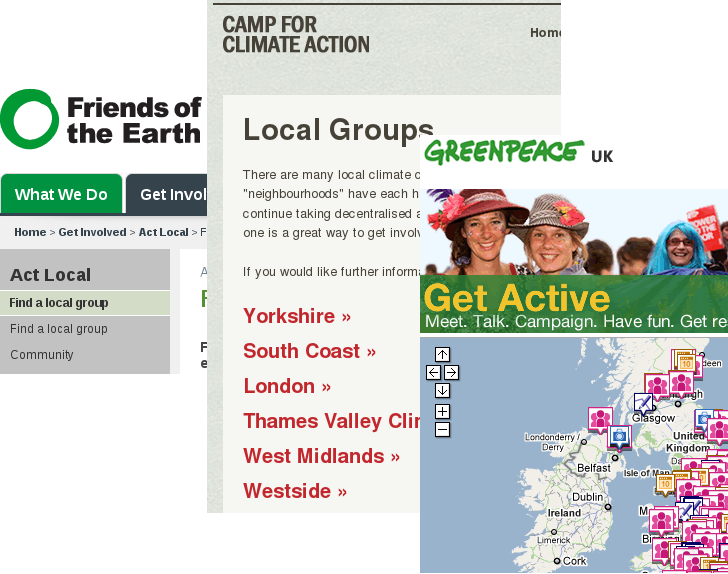 These 3 models had been chosen to span the spectrum from top-down organising with limited autonomy, through to the decentralised model of ‘disorganisations’ such as Climate Camp. when NGOs throw volunteers in at the deep end (to deliver training to their peers, for example) how many sink, and how many swim? The rest of the session was given over to the group, borrowing from Open Space, to set the agenda and have the conversations that were important to them. Interestingly there wasn’t a huge demand for space on the agenda… there seemed to be some reluctance to embrace the open space which was reflected in the evaluations. Quite possibly this is because open space is still relatively new in campaigning NGO circles – it could well have been the first time many of those present had encountered it. And, because it was a relatively short session they didn’t have long to acclimatise. Katharine took away the evaluations, so I’ll feedback on those in more detail when she sends them round. This was a precursor to a full day skillshare on November 30th. If your organisation would benefit from being there, contact us or subscribe to the Forum email list Capacity_Building_NGO_Forum-subscribe(AT)yahoogroups.com – replacing (AT) with the @ symbol. < Clicktivism & critical paths	> Lights, cameras, direct action! Opportunity to hear the different types of structures in place was excellent as I am currently thinking about a model to implement! Good to know that the difficulties are universal! Open space – never felt I could leave the first group I went to. Try World Café instead? I personally found the open space too wide-ranging as I wasn’t ready to choose – would have preferred to hear more about more individual organisations, what their model is, key issues, then maybe identify the discussion topics as a group. But maybe this is what the full day should be for! Perhaps flagging up that questions/issues raised during the presentations and Q&As could be good topics to hold on to for the open space?